The original logo for the game's international release, shown at E3 2003. Note its similarities to the game's Japanese logoMedia:MLSS Japan box art.jpg with the decorative bean design. This is a list of pre-release and unused content for the game Mario & Luigi: Superstar Saga. The sprites of the unused characters. Wario, Fox McCloud, Captain Olimar, Samus Aran, Toon Link, and even an Excitebike Racer (not updated for the game's art direction and thus remaining in 8-bit graphics) were going to show up in the Starbeans Cafe after Mario and Luigi made a drink, instead of E. Gadd (who was only scheduled to make one appearance). Cashier : Oh! Professor Gadd! How’ve you been, sir? Are you here to try our new drink? You can ask those two there for Woohoo Blend! Wario: Ah ha ha ha! Move it! Wow! Now that I’m here, this game’s finally gettin’ good! Cashier: Oh! Wario! What’s a bad dude like you doing here? Oh! I got it! You came to pay your tab from the other day! Wario: Uh... OK. Maybe next time. But... Don't you have free drinks for celebrity guest stars in this game? Wa ha ha ha ha ha ha! BLECH! AWFUL! Do you guys really like drinking nasty stuff like this? ...Losers. Ah! Whatever! Hope this covers your costs! Blech! Drinkin' that stuff made me wanna go shave my tongue! Uh-oh! Gotta go! Fox: Uh...yeah. So why don't you serve me up a cup at your special guest star rate? What’s that? A call? Slippy Toad: Fox! Help me! Fox! Where are you? Cashier: Wow! You sure are one busy guy... Er, I mean, one busy fox! Note: Olimar’s text would appear on the screen the same way the item text does (i.e. “You got a Mushroom!”), meaning he would not have a speech bubble. Olimar: What is this? Before my eyes stands a strange life form. It resembles me slightly, so I shall dub it...Marlio! ...Further investigation indicates that the drink that this Marlio holds is the source of the aroma. I shall now partake of its flavor. Why! Its flavor is most satisfying! Finding that such a drink could be partook of in such a place is a tremendous discovery, indeed! This Marlio creature exhibits what seems to be a longing expression... Perhaps it will react if I present it with something... I have just noticed a strange, unsightly green creature standing next to the Marlio... It could be a dangerous life form. I feel I should attack it before it attacks me. Cashier: Whoa! A power outage? Yikes! Samus Aran! I see you're rocking and rolling as usual! ...Looks like your energy tanks are empty! Sorry, but can't you give your Hoolumbian to Samus? Oh! Feeling better? Cashier: Hey? Is that the sound of a motorcycle I hear? Hey, buddy! What are you doin'?! This isn’t a drive-through! What? Are you thirsty or something? Fine, but no need to get so...EXCITED! Are your engines on full throttle? Cashier : Whoa! Link! The Hero of...what is it, now? Anyway, long-time, no see, buddy! What are you doing here? Did you get lost in a dungeon again? What? You're having trouble finding the fairy fountain? Oh... It’s game over, and your bottles are all empty? Are your hearts filled now, kiddo? Sprites of a mysterious fortune teller-like character, an early Lady Lima, and an unused palette for Boddle's assistant have also been discovered within the game's data. However, these colors are used in the remake, Mario & Luigi: Superstar Saga + Bowser's Minions. A few unused items include Neon Beans, a Game & Watch, and an item known as the "Spiritual Bros.", which may have been intended to be a badge. A badge named Soulful Bros. does exist. Therefore, Nintendo may have attempted to rename this item. Originally, the Bean Fruits were each intended to be a different color, rather than the identical bean fruits of the final game . A book, similar to the ones in Beanbean Castle, was also, a possible item. So was an unknown key. The unknown key is an icon that would be used with key items in a similar way to badges having badge icons beside their names. In the final game, the key icons were unused. Red and green Blocks, without "M"s or "L"s, were going to appear also. Badges were also in blue and yellow-orange. In a case exclusive to the American version, the Oho Gear was unobtainable through legitimate means. The gear, which ups Defense by 28, was changed in the Japanese release so that it is dropped by Boomerang Bros. The name "Sharkbone" appears alongside names for enemies found in Gwarhar Lagoon in the game's coding. "Sharkbone" is presumed to be an alternate name for the ???? enemies that are actually found in the final game, as these enemies actually can come in a bony shark form, although they are also found in a living, Cheep Cheep-like variety. The Nintendo Power guide actually referred to the ??? ?s' undead shark forms as "Sharkbones" and their living Cheep Cheep forms as "Puffer-Cheeps", the latter being Cheep Cheep varieties present in the final game. It may also be worth noting that the German version of Mario & Luigi: Superstar Saga replaces "Sharkbone" with "Sand-Cheep." Smaller Fighter Flies in their older design, blue Goombas called Mossy Goombas, red Goombas called Pop Goombas, Paragoombas, a golden Bullet Bill in a raised Bill Blaster with a longer attack charge, Sergeant Starshade, a Hoohooligan called Nice Guy, and Sidesteppers were meant to be enemies. The green Oho Jee from the Surfing minigame was also supposed to be attacked like the red and blue Oho Jees of Oho Oasis, though it was apparently not planned as an enemy. The below charts include the statistics of the unused enemies, starting with a dummy/placeholder Goomba. The first enemy is speculated to be dummy or placeholder enemies, followed by more developed enemies (seemingly based on versions from Paper Mario), then finally tutorial enemies. Boddle's assistant had a different color scheme - brown hair and purple clothing, which would be applied to him in the eventual remake. The coins had a different design, and also came in blue, and red (but these were apparently supposed to appear in battle when fleeing). The 'Happy' statues in Woohoo Hooniversity were supposed to catch on fire. Mario and Luigi's icons at the top of the screen were entirely different. Woohoo Hooniversity's starting room looked totally different, and also had a battle backdrop. Since there are no encounters in the starting room, the background was never seen. Two unused soundtracks resembling simplified versions of Tomato Adventure's opening theme were found within the coding of Mario & Luigi: Superstar Saga after people dumped its entire track list into GSF files. 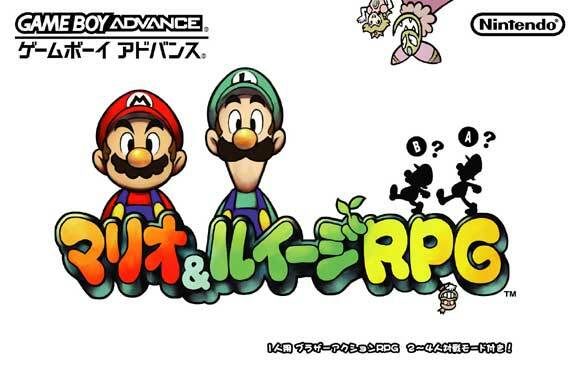 Tomato Adventure is a Japanese region exclusive RPG released in January, 2002. Tomato Adventure was also developed by AlphaDream and used a similar battle system to the one used in Mario & Luigi: Superstar Saga. A variant of the battle theme exists with a vastly different instrumentation, which matches neither the finalized original nor that used in the eventual remake. There is a jaunty theme that sounds similar to Little Fungitown's music, but without the Super Mario Bros. theme cover, and also a sinister theme sounding similar to that used for Woohoo Hooniversity, and the Teehee Valley and Beanbean Castle Town themes both have variants that remove the leads. Finally, the File Select theme has an alternate variation that uses the Game Boy's legacy channels in addition to samples for the lead, while the harmonization (which uses the pulse channels in the final game) is interpreted as samples of choir voices, which would be its interpretation in the remake's arrangement. There was also an unused Mario label, which had each letter colored differently, as well as a small star at the end. There is no Luigi label to go with it. Three different icons for badges. An early sprite of Lady Lima. The unused palette for Boddle's assistant. An early enemy, called "Mossy Goomba". A mysterious cloaked Beanish character. Yellow, red, and blue coins. Early sprites of Yoshi Eggs. Note how the colors are duller than those featured in the final version of the game. Early sprite of the Excitebike racer. A sprite of a statue that is on fire. Early sprite of what appears to be a Fighter Fly or a related enemy. The early sprite of Fox McCloud. Early sprites of Bean Fruit. An icon of Peppy Hare. The early sprite of Link. The early sprite of Olimar. The early sprite of Paragoomba. Early sprite of a "Pop Goomba". The early sprite of Samus Aran. Early sprite of Sergeant Starshade. An icon of Slippy Toad. An extended background for Beanbean Field. An early battle background for Woohoo Hooniversity. An early sprite of Wario. An early sprite of a Wiggler. Princess Peach's Castle in the Japanese version. The mushroom motifs are different. Peach's Castle in non-Japanese versions for comparison. ↑ Mario & Luigi: Superstar Saga E3 2003 trailer. Retrieved June 23, 2015. This page was last edited on February 9, 2019, at 01:47.